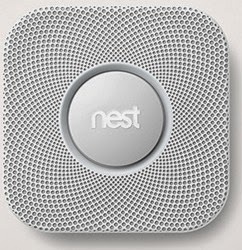 Hubby was all excited Saturday because local stores had received shipments of Nest Protect home smoke and carbon monoxide detectors and we. just. need. one. Naturally, I agreed (wire all the things!) so off he raced to Home Depot to score one before they sold out ("The site says they only have 5 in store. I have to go right now!") Forty five minutes later he was home, standing on a step ladder, installing our smart new fire alarm. Ok, to be fair, we did need one. We couldn't cook bacon without the old one screaming at us and my gimpy elbow screaming at me for having to wave baking sheets to dissipate any tiny wisp of that might have made its way under the smoke detector. When it goes off, you can wave your hand under it to tell it everything is ok and it will stop screaming. Oh, you want more? Seriously? Because I was sold just on that feature alone. There's an app for that. You can monitor your home from your cel phone. In fact, it will contact you when something happens. A non-Siri-like, human voice speaks to you to tell you what to do. It has a built-in CO2 monitor, which is great because that's a second device you don't need to test and maintain batteries. It connects to our current home automation system, Control4. Ok, not yet but it will next year. Which means we will be able to control it from our existing apps. 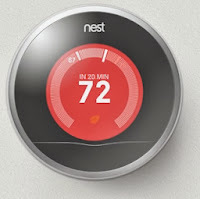 It connects to Nest Thermostat, if you have one. It works as a nightlight (called Pathlight). Personally, I don't find it bright enough to see where I'm going on the first floor but that could be because we have a street light in front of our house. This is definitely one of those home appliance type gifts that you might second-guess buying. But with all the geeky features, it definitely beats a toaster oven any day of the week.